It's smoked potatoes time with black garlic, ramp mayo and some kind of red sauce I'll get to in a moment. All this sounds a little odd, but it was one of our favorite dishes of the lot. Roasted potatoes with some nice smoke fluently throughout. Sometimes smoke can just overpower stuff but here it was just about right to add some earthy flavor. It was even a nice compliment to the ramp mayo, which at first sounds like "yuck, mayo on potatoes!?" But it actually works to add a real creaminess to the dish. The black garlic is sort of a vinaigrette which cuts some of the richness and adds more flavor levels to everything--I think that call that umami or something. As for the red sauce stuff you see in the pic, I'll be honest, I can't remember what this was. 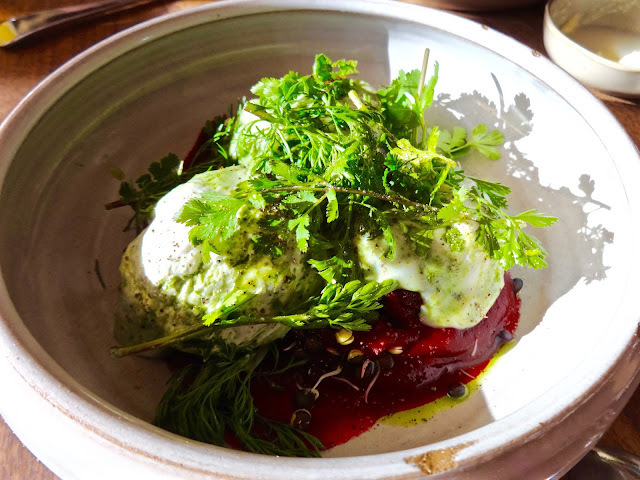 When we were eating, pureed beets kept running through my taste images, but at this point I couldn't tell you if that was from the sauce or the other ingredients. Ultimately it didn't really matter since we just plowed through them all. This was $12 a bowl and considering what you get, it was one of the best bargains on the menu. 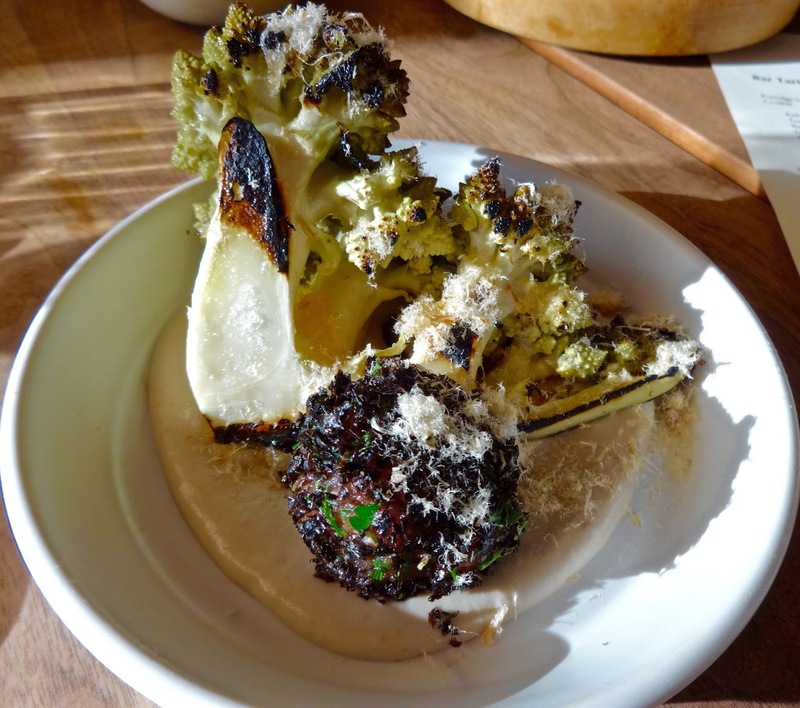 We also got a special concoction from the kitchen in this charred/roasted brocoflower with a sunflower tahini hummus sauce thingy. Since we didn't officially order this I'll just say it was a nice little veggie palate cleanser that was pretty much in keeping with the dish road we were already on. This wasn't so much cooked through as it was roasted on the edges thus it still had some crunch. Can't say if it was on the menu that I would have tried it but since it was proffered up, it was decent enough. 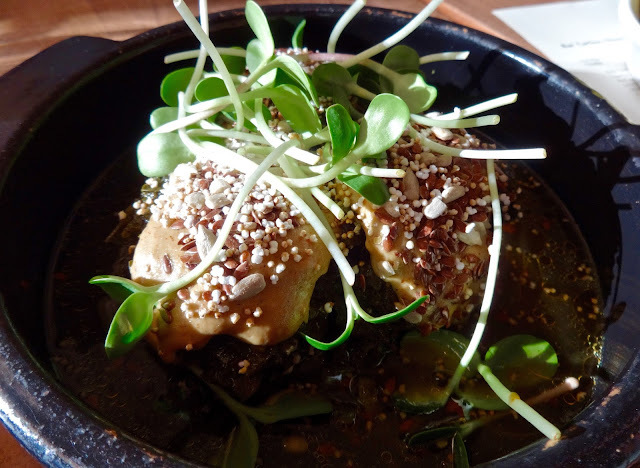 Our last savory dish was lamb sausage with sunflower tahini (again!) and chard. This kind of reminded me of a spicy merguez meatball and with the hummus like topping it felt more North African inspired. As a whole, it wasn't my favorite. Some of the seasoning was just a little off on my taste buds, bordering on slightly bitter. I couldn't put my finger on what was throwing my off liking the flavors here, but after 4 bites, I just couldn't. Everyone else didn't seem to have my issues and were able to finish off the bowl, but we can't say it was a favorite of the tables. When you throw in the $27 price tag--yeouch--it makes it even more unappetizing. I'll say right out I thought the price for what you get here was just too extreme. Of course we were not going to get out of here without dessert as me and Ms. O love us some sweets. 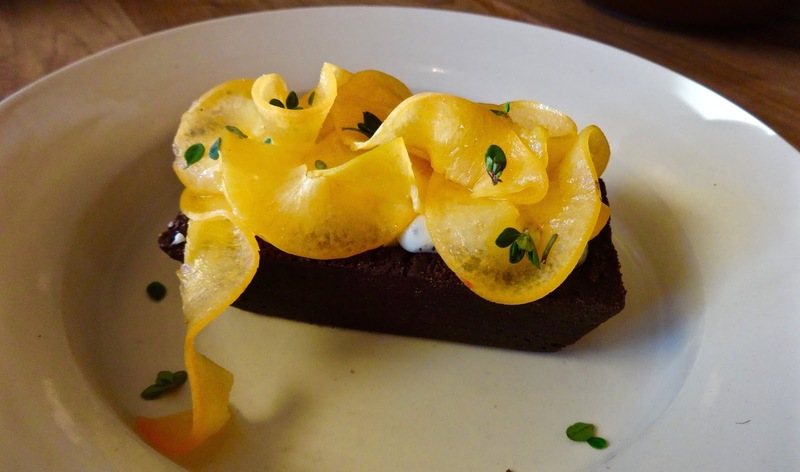 This said it was a rye tart with carob mousse, apricots and thyme. Not exactly what we were expecting. It was more mini loaf cake than tart and on my scale of desserts, I just didn't like it at all. While I'm not the biggest fan of rye or carob flavors. While it may be a healthier version of cocoa, it really can't compete with chocolate taste wise. For me the cake part was also a bit dry and there wasn't enough mousse or any sauce to help offset that. I'll give it a few props for not being terribly over sweet, but it bordered on savory to my tongue, which isn't something I necessarily like in my desserts. Ms. O and the BF were ambivalent about it too, though it didn't stop them from finishing it off. See, this is why it helps not eating alone, if you get something you aren't a fan of, hopefully one of your dining companions will jump to eat up. 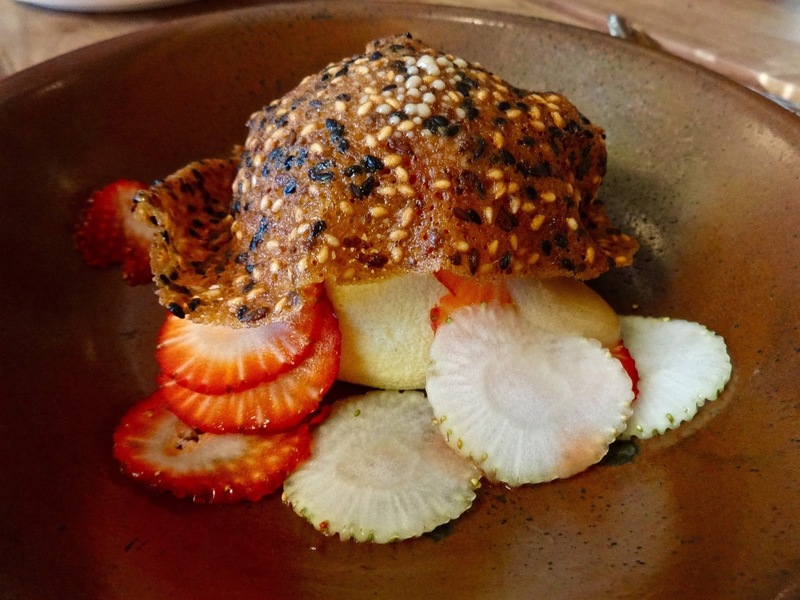 Lastly is farmers cheesecake with strawberries and a crunchy hood of caramel and various sesame seeds. Different than other desserts, yes. What I was hoping it was, not even close. It's not traditional cheesecake, it's more like cheesecake foam surrounded by strawberries. I just didn't like this either. Too much puffery and not enough heft for me. Ms. O liked this but it just tasted again like something was missing like a sauce or something to enliven it up. I've had my fair share of inventive desserts over the years and am used to it being a hit or miss proposition, though I will say I was disappointed that I ended this meal on an 0 for 2 streak. While it seems like Bar Tartine was a pricey hit or miss for me, I'm gonna say I did like this place enough to recommend it to folks. Of course, there are always caveats to that. 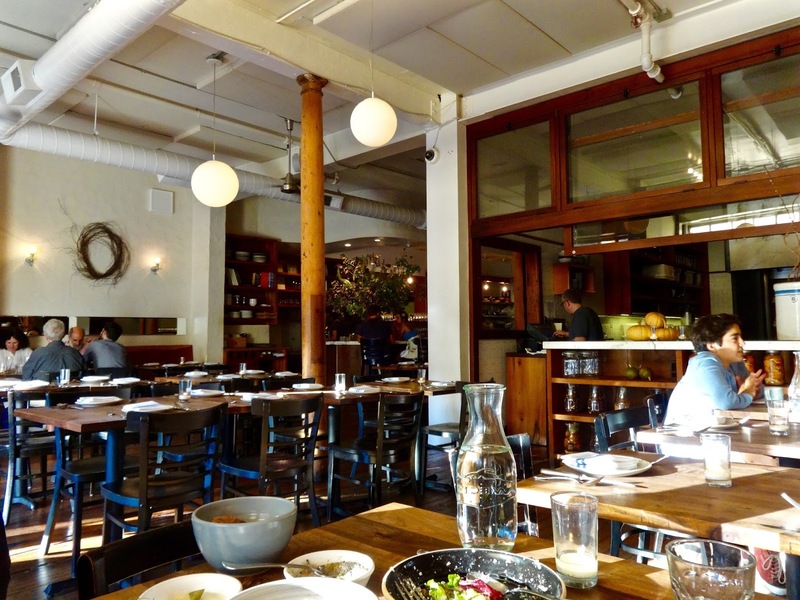 It can be an expensive dinner or lunch when comparing portion sizes and cost, even by San Francisco standards, but most dishes are tasty and inventive with fresh local flavors. I do suggest going with friends so you can share plates and try more, as splitting the tab will help keep one from busting the wallet. While they have a few mainstays, like the smoked potatoes, the menu does change regularly to keep up with daily market fresh offerings. And if you are into bordering on savory desserts, then you are in luck. If like me, you want something with a little more sweet and tad more heft, well, there's always a Happy Donut somewhere nearby.